Black soot lines the ceiling and walls as a mute testimony to the fathers, mothers, sisters and brothers for whom Auschwitz's liberation came too late. "What was surprising is how black the ceiling of the crematorium is after all these years," said Sarah Illingworth, a senior elementary education major from Remington. "The thought of those who perished there and whose ashes still remain was very moving." 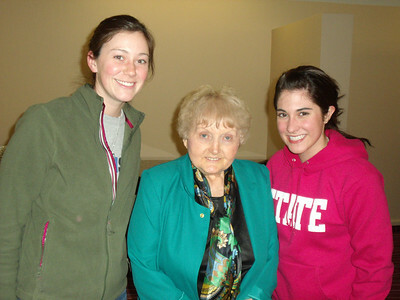 Another witness also remains - Holocaust survivor Eva Kor - and it was Kor who led three ISU students on a recent trip to Poland that coincided with the 65th anniversary of the liberation of the Auschwitz death camp. Illingworth, Karen Wenning and Brittany Chopson, along with a group from the CANDLES Museum in Terre Haute, experienced the bitter cold of a Polish winter and saw what remains of life and death at the camp. That real-life experience is exactly what Tanna Srulovitch wanted when she established the scholarship in honor of her family to help college students travel there. "I hope the students that went to Auschwitz could feel what happened there, to understand that real people were gassed to death and then burned to get rid of the evidence, to know that this can never ever happen again," she said. "By them being there and seeing and feeling the surroundings and experiencing what Auschwitz is all about will help them to teach their future students about Auschwitz." On the third day of the trip, which spanned Jan. 23-30, the group of more than 50 from Terre Haute visited the Auschwitz crematorium. There, in the soot-stained room, they lit candles and recited the Kaddish, a Jewish prayer that is part of mourning rituals. "I lit my candle in honor of those who have suffered from hate and in the hope that we would all teach future generations to be accepting and peaceful," said Wenning, a senior elementary education major from Greensburg. Nazis took the 10-year-old Kor and her family from their home in Romania, sent them to Auschwitz and separated Kor and her twin sister Miriam from the rest of their family. "The most heart wrenching was when she stood on the selection platform and told us this was where she last saw her father, mother and two older siblings," Illingworth said. "She never heard from them again." Inside the camp, Dr. Josef Menegle, a Nazi doctor known as the Angel of Death, conducted medical experiments on the twin sisters as part of his human research until the Nazis fled from the advancing Soviet Army. The Soviets liberated the camp on Jan. 27, 1945, four days before the sisters turned 11. "There are very few Holocaust survivors left, and it is rare to have the privilege to hear their stories right where they happened," Illingworth said. "Eva is a remarkable lady. It was also great to get to know her better and hear more about her message of forgiveness." "I wanted to learn more about the Holocaust and who better to learn from than a survivor?" said Wenning. "Aside from the many haunting facts and figures that I learned about the Holocaust and the Auschwitz camp itself, I learned that as hateful as the world can be, there is hope for tomorrow. I learned that the human spirit can overcome. I learned how amazing survival stories are, and what power forgiving someone gives to a person. I learned that hatred starts as a small idea or prejudice and it has to be stopped while still small." The bitter cold of Poland in January cut through Illingworth and left her imagining the same living conditions for the prisoners with their threadbare clothes, a stinky latrine, meager furnace, little food and straw mattresses infested with lice and fleas. "The thought of that some people actually managed to survive these conditions is amazing," she said. "I quickly took inventory of the layers of clothing I had on: three layers of pants, three layers of shirts, a winter coat, two hoods, a sock hat, a scarf, two pairs of socks, boots, two pairs of gloves, hand warmers and toe warmers." Wenning and Illingworth wrote a blog (http://isuauschwitz.blogspot.com/) of their experiences, that they also intend to share with their students. Third grade students in the town of Fowler, where Illingworth is student teaching, followed her journey on the blog. "They had many questions ready for me when I returned," she said. "It can be difficult to illustrate what I saw and felt to elementary students, but it is extremely important that they learn about what happened in Auschwitz and Birkenau." Illingworth alluded to philosopher's George Santayana's quote, "Those who cannot remember the past are condemned to repeat it." "We need to start by educating our students so that we can ‘Tikkun Olam,' repair the world," she said. Wenning said the trip changed her thoughts on small acts of hatred. "A dirty look or a judgmental comment is where hate starts," she said. "The Nazis hatred grew into the terrible tragedy that was the Holocaust. I hope that current and future generations can stop the hate before it becomes yet another tragedy." As a teacher, Wenning said, she can share her experience with future classes. "I will also teach them the importance of peace and forgiveness," she said. "That is important because stories like these need to be shared. It would be a crime to witness such an amazing experience and not share it with all who will listen." Cutline: Sarah Illingworth, Eva Kor and Karen Wenning (l-r) pose together in Poland. Illingworth and Wenning, Indiana State students, accompanied Kor, an Auschwitz survivor, to Poland for the 65 anniversary of Auschwitz's liberation. Courtesy photo. Cutline: Eva Kor, Auschwitz survivor, sits on the back of the furnace demonstrating how they would try to stay warm in the barracks. Courtesy photo. 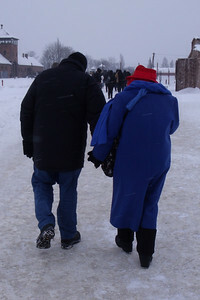 Cutline: Alex Kor walks with his mother, Eva Kor, an Auschwitz survivor, through the Birkenau Concentration Camp. Courtesy photo. 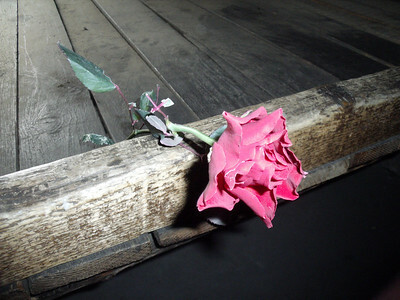 Cutline: Visitors placed flowers as memorials throughout Auschwitz. This flower was placed in the barracks. Courtesy photo. 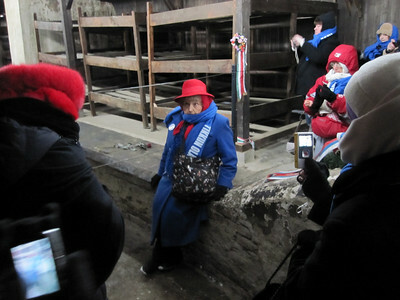 A group from the CANDLES Museum in Terre Haute experienced the bitter cold of a Polish winter and saw what remains of life and death at the Auschwitz death camp.